The new eight-disc limited edition Medal of Honor soundtrack collection from La La Land Records is impressive yet surprisingly inexpensive and just the thing for fans who can't get enough. If you dig Medal of Honor and you have a liking for videogame soundtracks, then you need to feast your eyes on this eight-disc Medal of Honor box set. Featuring remastered material from EA's archives as well as the private collections of the original composers, the first six CDs include the scores from the original Medal of Honor as well as MOH: Underground, MOH: Frontline, MOH: Allied Assault, MOH: Pacific Assault, MOH: European Assault, MOH: Rising Sun and MOH: Airborne. That's a lot of music, but that's not all. 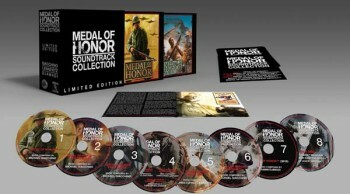 The seventh disc in the collection contains the full soundtrack to the 2010 Medal of Honor reboot along with unreleased bonus material, while disc eight contains other unreleased tracks from Airborne, Rising Sun and European Assault. The collection is accompanied by a 40-page booklet and comes packaged in a reinforced cardboard slipcase, with "an exclusive introductory quote from MOH creator Steven Spielberg." Only 2000 of these things are being made and La La Land sure isn't giving them away, but the price is actually a lot lower than I expected. It'll cost you $59.98 to take it all home, less than what the new Medal of Honor clocked in at when it came out last year. Given the sheer volume of music collected in this monster, I'd have to say that's not too bad at all.